As you can see from the picture the products and size are amazing! With a value way over the $19 a month there really is no way that you could good wrong. As my children and I worked our way through the products there was one thing we noticed, everything was really good! Which for obvious reason is great, no one likes a life full of things that bring no joy. I said earlier that there was more to gfreely then just it being a monthly subscription box. They also offer a great recipe section to make your new lifestyle just a little more easy, a blog where you can learn more about being gluten free and maintaining a healthy lifestyle, and a shop where you can purchase some of the new foods that you have grown to love. 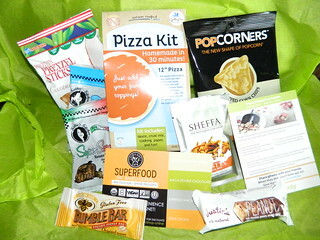 If you are living a gluten free lifestyle or have always want to try it this box is the way to go!